If you sprinkle a bit of cinnamon on your oatmeal every morning because you’ve heard it’s good for you, you’re not alone. Cinnamon -- the red-brown spice with the sweet-hot flavor that’s instantly recognizable -- has long been valued for its anti-inflammatory, antimicrobial, antibacterial, anti-fungal and anti-clotting properties. All natural cinnamon products -- including cinnamon extract and ground cinnamon -- are made from cinnamon bark, which contains beneficial and highly potent essential oils. While sprinkling some ground cinnamon on your oatmeal or stirring a teaspoon of cinnamon extract into a bowl of oatmeal will most likely benefit your health, consuming too much cinnamon could impose health risks. Cassia cinnamon contains coumarin, a compound that can cause liver damage in high doses. 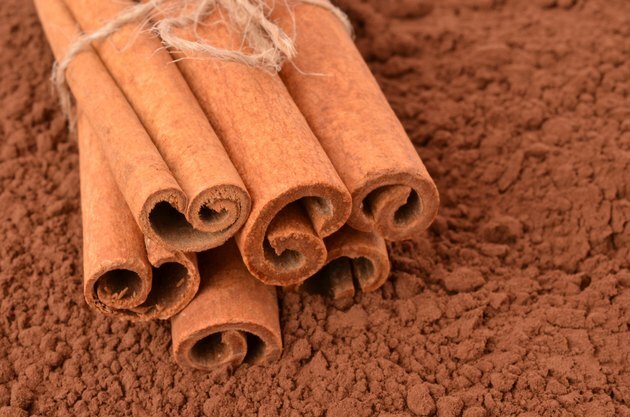 Coumarin is also an anticoagulant, which means that eating large amounts of cassia cinnamon could inhibit your blood’s ability to clot when necessary -- particularly for those already taking anticoagulant medications such as warfarin. Although there is no maximum established safe dosage for cinnamon, the average healthy person can safely consume as much as 6 grams of cinnamon a day for up to six weeks, according to the National Center for Complementary and Alternative Medicine. Pregnant women and anyone with liver or kidney disease should probably avoid high doses of cinnamon, according to NYU Langone Medical Center. If you’re interested in consuming cinnamon for its potential health benefits, ask your physician which kind to use and how much you can safely consume.